"This was a really bizarre disguise," said Brandon Clabes, police chief of Midwest City, Oklahoma. He was referring to the Spanx stretch girdle that a woman wore as a mask when robbing an Oklahoma McDonald's this week. "I wasn't sure what Spanx was," Clabes said. "I've never seen a woman with one on; now I've seen one on someone's face." This surveillance photo of the woman was shown on local television, and despite the Spanx, tips were called in that enabled police to make an arrest. 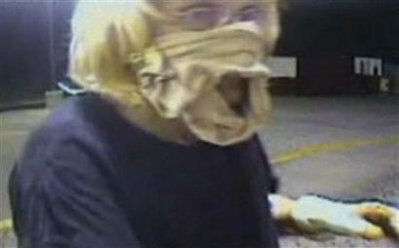 While the Spanx disguise was ineffecive in this case, it is at least much further along the continuum of underpants disguises than the ones deployed by two men in Denver in 2008, who robbed a gas station while obscuring very small portions of their faces with women's thongs. Unsurprisingly, the Thong Bandits were also apprehended.